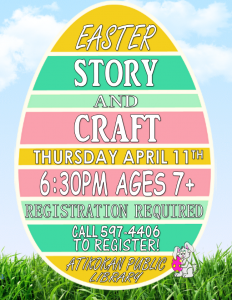 The Atikokan Public Library invites you to an Easter story and craft on Thursday, April 11, 2019 at 6:30 pm. Ages 7+. registration required. Please call 807-597-4406 to register or for more information.